‍British Prime Minister Theresa May’s stated policy, during her previous role as the Home Secretary, to create “a really hostile environment for illegal immigrants” in the UK, came haunting on Tuesday as she personally apologized for her government’s threat to deport an estimated 50,000 people who emigrated to the UK from Caribbean countries after the World War II. “I want to apologize to you today. Because we are genuinely sorry for any anxiety that has been caused,” she told the hastily-convened gathering. The government has faced outrage for its treatment of people who came to Britain between 1948 – when the ship MV Empire Windrush brought over the first group of West Indian immigrants – and the early 1970s. They and their parents were invited to help rebuild Britain after World War II and with many of them legally British – they were born while their home countries were still colonies – they were given indefinite leave to remain. But those who failed to get their papers in order are now being treated as illegal, which limits their access to work and healthcare and puts them at risk of deportation if they cannot provide evidence of their life in Britain. The row, which one MP called a “national shame,” has been hugely embarrassing as it coincides with this week’s meeting of the 53 Commonwealth heads of government in London. More than 50,000 people could be affected by the government’s immigration crackdown. 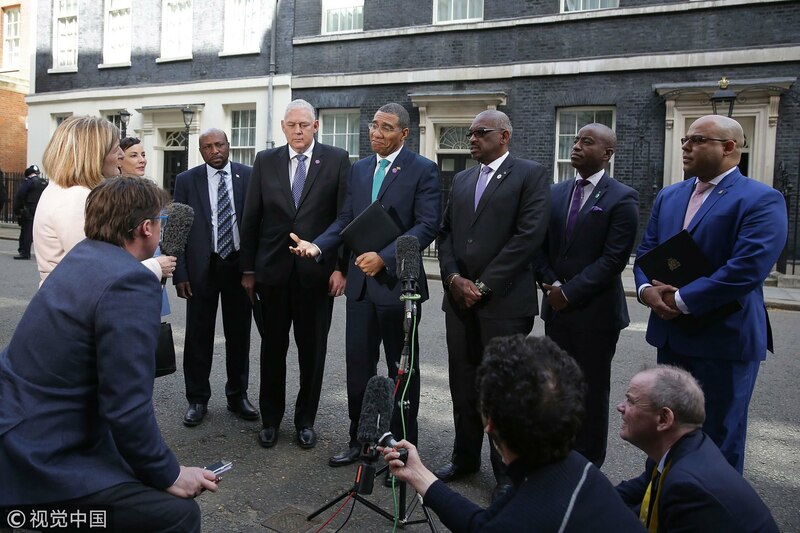 Timothy Harris, Prime Minister of Saint Kitts and Nevis, expressed hope that Britain would “do the right thing and make good any injustice,” including through compensation. Jamaican Prime Minister Andrew Holness, who earlier had a meeting with May, said he wanted a “speedy” response. The now elderly people involved “have significantly contributed to the building and enrichment of the country,” he said. Britain has written to each of the Caribbean governments setting out how it intends to rectify the situation, notably by helping anyone affected to find the necessary paperwork to regularize their immigration status. It has promised to waive the usual fee for residency cards, and “reimburse reasonable legal costs” incurred so far. But there was a further embarrassment for May on Tuesday when the Home Office – the department she led for six years – admitted it had destroyed some of the Windrush generation’s registration slips, which detail when they arrived in Britain. The issue came to light following a clampdown on illegal immigration spearheaded by May during her tenure as the Home Secretary, with requirements for people to have documentation to work, rent a property or access benefits including healthcare. “Due to the rollout of very intrusive and harsh immigration checks across everyday life, people are now finding themselves in situations where they are quite heavily penalized for not having that documentation,” said Satbir Singh, chief executive of the Joint Council for Welfare of Immigrants. Singh said those affected could suffer from anxiety and depression as they can be left destitute after losing work through being labeled undocumented migrants. “The mental toll is simply unimaginable. People who are told that they’re not British when they’ve spent their whole life thinking that this is the country that they belong to,” he told AFP. The scandal has also sparked concern about London’s ability to deal with millions of European citizens currently living in Britain who want to stay after Britain leaves the European Union next year. Ministers have agreed they will be given indefinite leave to remain, but they must apply for a new status.